(in the future) Mount Kukoeuk, Ant'kyhon (a.k.a Earth-Who c.21,000 A.D.-22,000 A.D.), (Muldwych incarnation, 1,000 year long exile). Spin-Offs (not actually including the Doctor at all): Strictly speaking none - he can't have a first appearance in something he isn't in. But click on the link for more info anyway. Powers/Abilities: As with other Gallifreyans, the Doctor is physically superior to normal humans in nearly ever respect, though not generally superhumanly so. He is slightly stronger than his appearance would suggest, has greater stamina and better than average agility. His senses are also slightly keener than a humans, and he is capable of noticing ripples in the patterns of time. He is capable of surviving without oxygen for short periods of time, and can even survive unprotected in the vacuum of space for several minutes. Among the more obvious physical differences between his body and that of a human is that he has two hearts. He is capable of healing most wounds given time, even regrowing severed appendages on occasion (although this can take weeks). If he suffers an injury so severe that he cannot survive then he is able to completely regenerate his body, taking on a entirely new form. Doing so causes near fatal mental strain, and as a result he generally suffers a period of mental instability thereafter, which in the past has manifested as amnesia, mood swings, and even full blown psychotic episodes; in the end his mind settles down again, but in every instance his personality is altered by the experience. Perhaps due to the strain this imposes, Time Lords can only regenerate twelve times, allowing them a total of thirteen bodies. The Doctor is moderately telepathic, another of his species' gifts. He cannot read minds, but is capable of communicating with other telepathic beings. Boosted by his TARDIS, this telepathy is able to act as an instant translator of virtually all spoken or written languages, a gift which is extended to those who travel with him; it is so effective that those using the gift are generally not even conscious of the fact that they shouldn't be able to understand the alien tongues they are listening to. Time Lords can recognise one another even when they have changed their appearances by their telepathic signature, unless one of them is deliberately masking who they are. The Doctor's greatest ability is his intellect. He is vastly more intelligent than any human, with extensive knowledge of most sciences, and an extremely quick and adaptive mind. He is resistant to forms of mental coercion such as hypnosis, brainwashing, mind control or mind probes. Trips into his mindscape has shown that each of his earlier persona's still survives there, acting as keepers of their portions of his memories and aspects of his personality (the fifth incarnation is generally seen as the conscience of the later Doctors, for example). All incarnations of the Doctor have been seen to be skilled hypnotists too, and most have displayed a talent for disguise and mimicry. The Doctor is a brilliant engineer, well known for his ability to build a device for any circumstances he encounters. He often jury-rigs temporary equipment to combat the evils he comes across if what he needs is not to hand. His most common tool (other than his TARDIS) is the sonic screwdriver, which can be adapted to a number of uses, most commonly to open locked doors of all varieties. It has also been seen to remotely detonate mines and swamp gas, to repel creatures with sensitive hearing, and even to remove screws. The Doctor stores a variety of useful objects in his pockets, which he has finally admitted have an extra dimension sewn into them, making them much bigger on the inside. Each version of the Doctor has certain abilities and skills peculiar only to that regeneration. The third was a master of unarmed combat, in particular Venusian Aikido, a talent he achieved without any training. The seventh could disrupt the brain's electrons with a touch, allowing him to render people unconscious. The eighth has the ability to read the patterns of time, allowing him to pull out hints about a person's past or future from their timeline. While the Doctor normally disdains physical violence, he has shown himself in the past to be a skilled swordsman (at least from his fourth incarnation on), having been trained by one of Cleopatra's guards. He is an expert with a crossbow (trained with William Tell), and even his first, elderly form was an able fighter, having learned wrestling from the Mountain Mauler of Montana. History: (Summary) A Gallifreyan Time Lord and adventuring time traveller, travelling the universe to right wrongs. Able to regenerate when at the point of death, he has now gone through several incarnations and moved from television to books, comics, radio and audio plays when the BBC stopped making the series. To date the Doctor has gone through ten personas, and is currently in his eleventh. He almost always travels with companions he has met in his journeys, from his grand-daughter Susan at the start, through school teachers Ian and Barbara, Scots piper Jamie McCrimmon, reporter Sarah Jane Smith, the savage Leela, fellow Time Lord Romana, teenage rebel Ace, and the shapeshifting Frobisher. His most common mode of transport is the TARDIS, his larger-on-the-inside-than-out time machine, although when on late twentieth century Earth he has made use of a yellow roadster, Bessie, provided to him by UNIT, a taskforce dedicated to protecting Earth against alien threats. This taskforce was originally commanded in Britain by Brigadier Lethbridge-Stewart, probably the Doctor's greatest ally. Comments: Created by Sidney Newman and Donald Wilson. Doctor Who remains the longest running science fiction show on television. Because of this long life, it is incredibly hard to quantify in a concise manner. There are 155 television stories - well, 156 if you include Shada, which was partially filmed but never completed because of a strike; well, 157 if you include Dimensions in Time, which was a charity special which even the BBC press release called a pantomime, so not many fans count it. But then there is the U.S. TV movie, a co-production which some fans count and others don't. And there's Curse of the Fatal Death, which everyone seems to love, but no one wants to treat as official because then the Doctor is effectively near the end of her life by the end of it. Then there was the Doctor Who night on BBC which included three mini-episodes. And let's not get into the Doctor Who episode on Jim'll Fix It, or Search Out Science, which he presented, or for that matter, the Disney Time special which the fourth Doctor presented. So how many TV stories have there been? At least 158, and no more than 165 seems to be about as close as you can really get. Similar problems lie in saying exactly how many episodes of the show have been made. The first story is titled An Unearthly Child, yeah? That's what the BBC Enterprise video release calls it. Sorry, but the fans tend to call it 100,000 B.C. (or sometimes, less frequently, A Tribe of Gum). The second is The Daleks...or maybe The Mutants. The third is Edge of Destruction...or Inside The Spaceship. Give up yet? What about how many Doctor's have their been? Surely that's easier to answer? Nope. Nine is the most accurate answer, but... The eleven television incarnations of the Doctor have been played by William Hartnell (1st), Richard Hurndall (1st, in the 20th Anniversary special after Hartnell passed away), Patrick Troughton (2nd), Jon Pertwee (3rd), Tom Baker (4th), Peter Davison (5th), Colin Baker (6th), Sylvester McCoy (7th), Paul McGann (8th), Christopher Eccleston (9th), David Tennant (10th) and current incumbent Matt Smith (11th). (So that's eleven in total - if you don't count Edmund Warwick who played Hartnell's double in one story). In other, BBC licensed productions, he's been played on stage by Trevor Martin and David Banks, and while not strictly the same character, Peter Cushing played Doctor Who twice in the cinema in the 1960's. He has also been played by a string of actors in a Comic Relief Charity Special - Rowan Atkinson (9th Doctor), Richard E. Grant (10th Doctor, though he would return to the role as the 9th on the internet), Jim Broadbent (11th), Hugh Grant (12th) and Joanna Lumley (13th). Actor and writer Mark Gatiss portrayed the Doctor in a number of short sketches during a Doctor Who themed evening on BBC 2, while in licensed audio Geoffrey Bayldon, David Warner, David Collings, Sir Derek Jacobi (who was also the Master in the new BBCi play which introduced the internet ninth Doctor AND was the Master when the character was reintroduced to the current version of the series), Nick Briggs and Arabella Weir have also played him. Richard E. Grant was officially recognised by the BBC as the new Ninth Doctor as of November 2003 (the fortieth anniversary) in a fully animated audio play for BBCi, but the relaunch saw him downgraded to an "Unbound" Doctor. So, not including fan produced but still BBC sanctioned plays, that makes at least 25 actors who have played Doctors. And we haven't even started on the books yet. Given all of the above, I've split off individual pages to cover more aspects of the character and the show in greater depth - effectively a site within a site. Like the main International Hero site, it'll never really be complete. As I explain in the history, Time Lords of the modern era are arranged into houses with 45 Cousins in each. But Irving Braxiatel is described as the Doctor's brother. How can this be? Brax isn't one of the Cousins, as all of them are accounted for in the same story that introduces the House of Lungbarrow. It could just be a term of affection, but the way it comes across, that doesn't seem right. More likely is that Braxiatel also shares some of the Other's genetic heritage (or has the genetic heritage of the Other's brother), and in the same way Susan and the Doctor recognised each other when they first met, so too did Braxiatel and the Doctor. The Doctor will in a future incarnation become known as Merlin. We even know which incarnation (it's the one who also calls himself Muldwych), and what he looks like. The Merlin met by the fourth and fifth incarnations of the Doctor bears no real resemblance to Muldwych; he does however look exactly like one of the forms taken on by the Merlyn who gave Captain Britain his powers when that character shapeshifts in Daredevils #1. It should be noted however that this isn't a guarantee that the Doctor has met that Merlyn. While unlikely, it's conceivable that the Merlin of the Neutron Knights story might be another incarnation of the Doctor. The story which first tells us the Doctor will become Merlin also implies that he will regenerate while using this name. The Merlin of Neutron Knights could be the first incarnation of the Doctor to use the name, and Muldwych the second. Captain Britain's Merlyn could very easily copy his appearance if he so desired. Confused? That's what you get when you have two extremely manipulative individuals who change names and appearances on a regular basis and aren't beyond pinching other people's identities when it suits them. The other Doctor who turns up at Maruthea in the comic strip "Party Animals", from the seventh Doctor's future, is commonly known as the Nth Doctor. He is based on Nick Briggs, an actor who played the Doctor in a series of fan-produced, unofficial audio plays in the early 1980's. Nick has subsequently gone on to write and produce a number of the official audio plays. Ria was played by Patricia Merrick, Liz Knight and finally Heather Barker in the original plays. Bonjaxx's party marks his first comic appearance, but not his last. 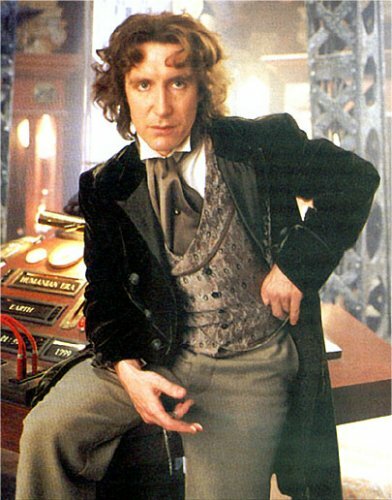 During one of the eighth Doctor's comic strip appearances the Doctor appeared to suffer severe injury and regenerated into this version, making him the Ninth incarnation. It was subsequently revealed that the regeneration was a ploy to draw an enemy out while they believed the Doctor was vulnerable in the period just after his transformation. The Doctor was fine, and the being who had regenerated was in fact a disguised Shayde. So while we know that this is a future version of the Doctor, we still don't know which one. Other future incarnations of the Doctor include his Merlin self, also known as Muldwych. At first described as having red hair, by the time we encounter Muldwych he has spent 1000 years exiled on a barren future Earth, and is now white haired and balding. A series of actors played the ninth through thirteenth Doctors (listed above) for the charity programme Comic Relief, but even the most die hard inclusionist doesn't tend to treat this story as canon - just fun. The last known future incarnation of the Doctor is the 42nd incarnation (so somehow he got round the limitations on how many regenerations he could have; hardly a surprise, he's the consummate rule-breaker). This Doctor turned up in the epilogue of one of the official novels, although the editors cut him out before it went to print (spoilsports). He's been happily married since his previous incarnation. Thanks to Kelvin Green for the clarifier about the Japanese Doctor Who. Doctor Who, evil Japanese scientist who dresses somewhat like the first Doctor, from 1966 Toho Studios movie "King Kong Escapes"